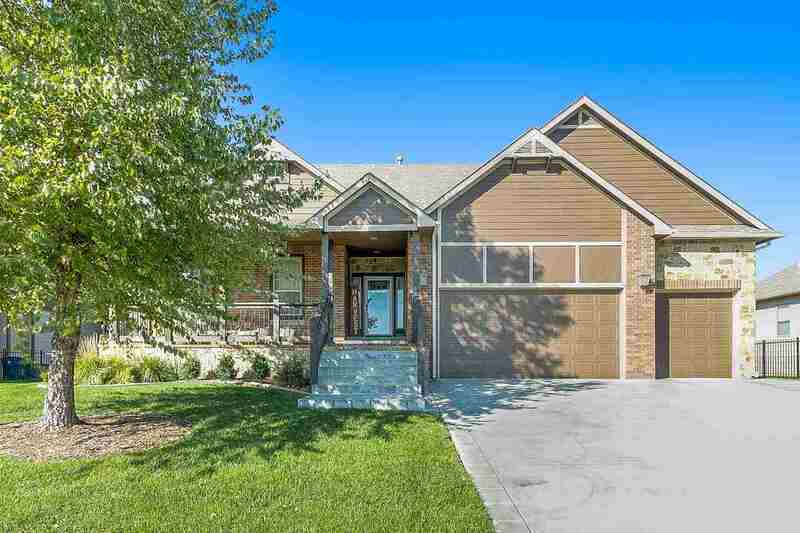 Beautiful, spacious and well maintained home located in the Maize School District! You will notice the curb appeal of this home with a perfect front porch where you can sit and enjoy the view of the lake! The current homeowner had the exterior of the home professionally painted and woodwork professionally stained to add to the attraction of the exterior! As you enter this home, you enter into a stunning foyer which walks into the grand space of the main level. The living room boasts an eye catching fireplace, built in bookshelf and gorgeous wood beams on the ceiling and large windows allowing in natural sunlight. You will appreciate the true move in ready home after the current homeowner also had the interior walls professionally painted throughout! The kitchen holds a large island with granite and custom, knotty alder cabinetry. This split bedroom home has a large, master bedroom which also shows the warm, wood beams. And don't miss the amazing, recently updated master bath with separate soaker tub and shower! You will also appreciate the new, clean carpet in each bedroom and on the stairs leading to the basement. Moving into the recently fully finished basement, the downstairs has a huge family room with wet-bar, a 4th and 5th bedroom with a full bath. While in the basement, don't miss the large, storage room, newly installed water softener and whole house humidifier. Outside is perfect for enjoying time with family or great for entertaining it offers both a covered deck and new, large patio with a built in fire-pit as well as the newly installed wrought iron fence for added appeal and use of the backyard. Updated landscaping has been completed to accommodate HOA requirements! The irrigation well and sprinkler system make this outdoor space easy to maintain. This is a home you will not want to miss!